Righto, so now I'm a mom, I'm *obviously* qualified to tell all soon-to-be (and other new) moms the dos and don'ts. Hahahahaha. Not really. I hope no one believes that. But, what I did want to do is write a post on what we found most useful and what we wish we hadn't spent any money on ... and as a new mom (she's 9 months old already, do I still qualify as a "new" mom?) I'll definitely be refining my list of gifts for baby showers. Before I was definitely the books-or-clothes buyer. That was because that was the most fun for me. Now I reckon I'll be a lot more practical about it. I loved that these had the umbilical cut-out and the wetness indicator (till Stage 3 ... I couldn't believe one might ever not need it, but you get the hang of it! Haha). We made sure we had a pack of Huggies & Pampers to try to see which we preferred. We've stuck with Huggies and have been very happy with them. We received a pack of 4 of these amazing Aden + Anais ones as a gift before the Babe Girl was born. OMG we use them for EVERYTHING (still). 4 is probably unnecessary, but I couldn't live with less than 2. (Also, these are what we ended up using along with simple cotton blankets to swaddle her in because they were bigger and stretchier than the swaddling blankets we'd bought). This was a spur of the moment purchase before the Babe Girl was born and after our First Aid Course. But we used it till she was unswaddled and would definitely use it again if we had another. I can't say if it helps with colic or reflux because the Babe Girl never suffered from either. We didn't start out swaddling the Babe Girl, but when we first ran into a sleep issue (around 10wks), we started to (as well as adding a dummy). She is a very active little girl and would wave her arms and legs and seemed to work herself up instead of calming down to sleep. She was quite the little houdini and master of the escaping arms, so before long we were using a 2 blanket variation on the Burrito style. When she hit her 4 month sleep regression, we tried freeing one arm, hoping she'd be ready but no luck. Around 6 months, we knew we had to find a way out of the swaddle. And these were the 2 sleep sacks I used. It was winter, so we were lucky and for a while I actually used the Swaddle Up 50/50 inside the Weighted Sleep Sack (because it allowed "free" arms so we weren't quite ready for it yet, but she seemed to need the weight). If I did it again, I'd just start my baby in the Love to Dream Swaddle Up 50/50 from birth. Honestly, at some point she just "got it" cause she wasn't sleeping swaddled at daycare and we didn't really have to do any phasing of one arm at a time. I got 2 of these in my baby showers and it seems ridiculous at the time. But literally we used this every single day in Joburg. We use it a lot less now, obviously. But along with the FloBaby Saline spray, this was a lifesaver. It may sound gross and, honestly having 2 of them I never tried an alternative, but it freaks me out less than a vacuum attachment! We were all set to get one of those plastic, shaped baby holders for the bath till we saw this used in our Antenatal class and immediately switched our thinking. This was a far better choice for us because it was much cheaper and we didn't end up using it for too long. Bath-wise we started with a cheap rectangular plastic basin from Pick n Pay that was easy to move and bathed her on the chest of drawers in her nursery (honestly, the only thing we used her nursery for in the first 3 months!) 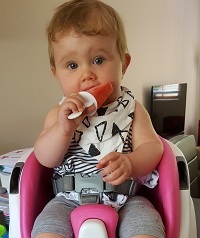 and then as she got older and preferred to sit up (although supported) we got one of the small plastic baths with the moulded seat and just put a non-slip mat in there. We're still using that for her now. It wastes too much water to run a full bath for her. Our dream bath buy would've been the Baby Dam! We chose this over the usual Bumbo seat because, although it was more expensive, it had 2 built in sizes (because the colourful inner seat can be removed as your baby gets bigger) and has the tray built in (afaik this is an additional purchase for the Bumbo seats). It has straps to keep the baby seated and also includes straps so that it can be "mounted" securely on a dining room chair or barstool. We use this whenever we feed the Babe Girl (and she is still in the smaller seat). She is starting to be able to rock herself forward in it, so we tried it strapped to one of our barstools the other day. Which was great, aside from her swiping all her food onto the wooden floor (usually that'd be the granite counter, where she is seated). Haha. Fun times. When we started feeding solids, I found it crazy that we basically had to change her outfit and bib after every feeding. Eventually I found her an "art" apron that had full sleeves with elastic wrists at Clicks (I say "art" apron because when another Mom friend of mine saw me feeding with the Babe Girl wearing it she was so surprised because she had a few of them but had never thought to use it for that ... I asked her what on earth she used it for then. Art, apparently. Haha). If you are planning on making any of your own food to feed your baby when starting solids, this is the author that was recommended to us and the one I'd recommend to you. We (mostly The Trucker) have made loads of things from this book. She has an app as well, if that is your thing. The Babe Girl never took to sippy cups ... I tried 2 different ones with different shaped spouts and she was having none of it! She was only interested in her Pigeon Bottles or a glass like Mom & Dad! We started out with giving her water from tumblers and bought plastic cups for her while we figured out what to do. A friend suggested we try a straw-cup. I bought one and although it didn't work then, she has started using it now at 9 months (which her daycare told me they'd never seen a 9 month old do successfully before! #proudmama). And then we found these no-spill cups that felt like a glass to her ... there was no spout to drink from and she could pick it up and drink from anywhere around the edges. Personally, I think this is the way to go because, lets face it, aside from drinking thru a straw, all future drinking will pretty much be from an open container, not a spout. The Babe Girl is (understandably) not very interested in the books I read to her yet. But she adores her texture ABC book. It is a thick board book and she can turn the pages (with a little help) and knows where to feel everything. 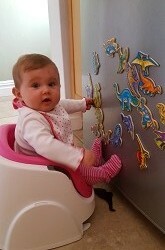 And her favourite is definitely the mirror on the Y for You! Haha. That is about the only book she is personally interested in ... aside from magazines / paper for ripping at the moment. They all seem to reach a certain age and then all they want to do is grab your keys and slobber all over them :) We decided to make the Babe Girl her own set of uncut keys. This goes along with similar ideas of the "Busy Board" or toys around the house. Colourful measuring spoons, funnels, cardboard boxes (her current absolute favourite toy in the world is a blue Bicarbonate of Soda box! #sigh) and, of course, plastic containers in all sorts of sizes and shapes. As mentioned above, never under estimate the simple toys ... and cat toys seem to be a favourite. 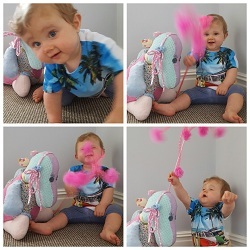 Ball toys of all sorts are brilliant for babies. The variety is awesome: big and small and ones with bells in and ones with holes. And then there are the cool wand-style cat toys too. We bought ourselves 2 BabySense swaddling blankets (even before she was born) - the Cuddlewrap and Cuddlegrow. And because (as mentioned above) she was such a little houdini, they never ever worked and we barely used them because they couldn't even be used as regular blankets because of their custom shape. We had one of these. We used it a few times. But since we got our hands on the Neurofen for Children (which apparently now they are saying you should only use if your child is over a year, but previously was from 3 months. 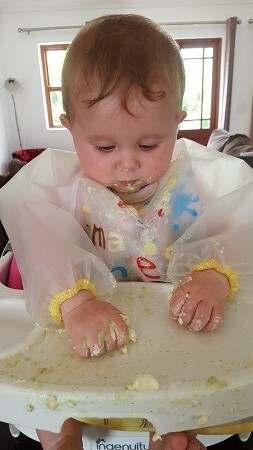 My Paediatric GP says it's fine so we've used it, only occasionally, since she was about 7 months), we have used the "syringe" that came in that for everything. It is fantastic! We bought a "proper" one of these. The AngelCare one. The one that can measure across the forehead or in the ear. We've never had a reading we trust on it. Apparently the forehead is a terrible way to measure temperature. And you need to pretty much be a nurse to figure out how to "pull" the ear to get a proper reading too! I've had it demonstrated almost every time we go to a vaccination ... you know, just in case. Luckily tho, the Babe Girl has never had a fever. I wouldn't recommend not buying one at all. You're an expectant mom, there is no way you won't want to feel like you're prepared for every eventuality. But you may want to ask around amongst your parent-friends to find someone who has successfully used one and what brand that was and go round and test it out and make sure you have the hang of it to make sure you're spending your money on something you can actually use. I was so certain I needed this. I hated not being able to see her in her backward facing car seat, behind my chair. When she was wailing the entire drive it was torture ... but when she went quiet, I would freak out too. There was no happy middle ground, so the mirror seemed the ideal solution. It was useless. We couldn't get it to stick properly to the rear windscreen. It was TINY so you couldn't see nearly as well as the packaging implied. And honestly it was too dark in the back of my car to actually be able to make out any detail in the mirror either. This one has sat in the cupboard after spending about a week in my boot after the second time it fell off the rear windscreen. I was terrified of teething (needlessly so, so far, as we discovered the Babe Girl's first tooth on 20th December because I felt it while feeding her) and so, to be prepared, bought her a pack of these. 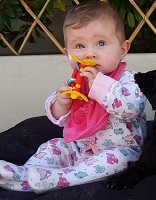 Dummies seemed like such a smart and easy solution to help sooth sore gums while teething, right? Well we could never get these dummies to actually fit into her mouth! And if we did she spat them right out. Now they're in her toy box and sometimes she finds them and chews on the one end of the inner part ... but most on the outward facing bit. Haha. Typical. We found the Pigeon teethers a much better solution (we have step 1 & step 2). The Babe Girl hated tummy time ... she wanted to be sitting, always. So I thought a Pop-Up Paymat might be the answer when I saw The Hungry Caterpillar one at Exclusive Books. It was a total waste. It didn't encourage her to spend time on her tummy at all and just sat on the floor in her room gathering dust. The minute my baby started to crawl for reals (26 December, in case you were wondering), I began to worry about her sensitive little knees on the carpet. And make no mistake, those first few days will likely lead to reddish skin. I rushed off an bought some Plod Ons for her. If I was smarter (and had known then that I could), I would've returned them immediately. They were far to tight for her pudgy thighs and she never got the hang of them and I never made her wear them much. It really wasn't something she needed at all!